North Korean orbital launch vehicle. 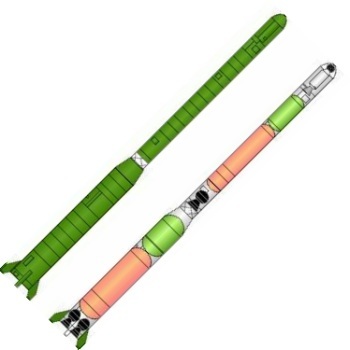 The third stage for the satellite launch version was probably a small solid rocket engine. 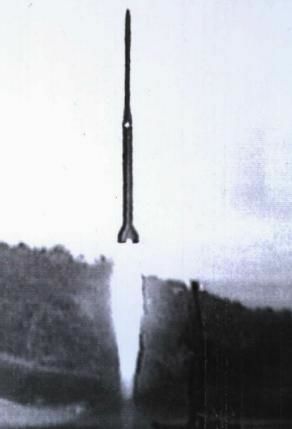 It failed to reach orbit in the 1998 launch attempt, and later such tests are believed to have used a different design. AKA: Pekdosan-1;Taepodong 1;Hwasong 8. Status: Retired 1998. First Launch: 1998-08-31. Last Launch: 1998-08-31. Number: 1 . Payload: 6.00 kg (13.20 lb). Thrust: 525.25 kN (118,081 lbf). Gross mass: 33,406 kg (73,647 lb). Height: 25.80 m (84.60 ft). Diameter: 1.80 m (5.90 ft). Apogee: 220 km (130 mi). North Korea announced the launch of its first satellite on 31 August 1998. Despite these claims no foreign observer ever detected the satellite visually, by radar, or picked up its radio signals. The Pentagon at first claimed it was an ICBM launch, and that the satellite story was just a cover for the test. However on further analysis of the data collected on the launch they admitted nearly a month later that there had been a satellite launch attempt. What seems to have happened is that the third stage either failed and fell into the Pacific or misfired and put the satellite into a low orbit where it decayed very quickly before it could be detected by foreign observers. 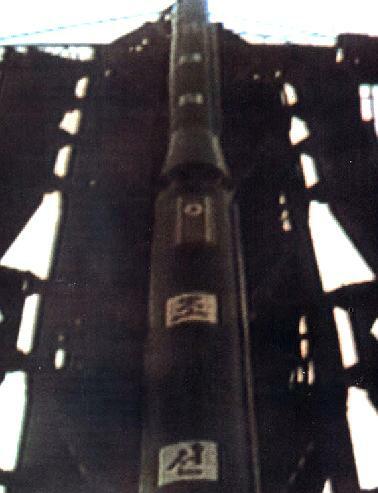 The No-Dong 1 IRBM first stage used a cluster of four rocket engines derived from the �Scud-C' version produced by the North Koreans. These missiles were developed and put into production in North Korea with assistance from Russian technicians from the Makeyev design bureau in the Gorbachev era. The specifics of the vehicle provided here are according to a 1998 Russian engineering analysis of the publicly released information and video. Our scientists and technicians have succeeded in launching the first artificial satellite aboard a multi-stage rocket into orbit. The rocket was launched in the direction of 86 degrees at a launching station in Musudan-ri, Hwadae county, North Hamgyong Province (40.8 deg N, 129.7 deg E) at 12:07 August 31, 1998 and correctly put the satellite into orbit at 12 hours 11 minutes 53 seconds in four minutes 53 seconds. The rocket is of three stages. The first stage was separated from the rocket 95 seconds after the launch and fell on the open waters of the East Sea of Korea 253 km off the launching station, that is 40 degrees 51 minutes north latitude 139 degrees 40 minutes east longitude. The second stage opened the capsule in 144 seconds, separated itself from the rocket in 266 seconds and fell on the open waters of the Pacific 1,646 km off from the launching station, that is 40 degrees 13 minutes north latitude 149 degrees 07 minutes east longitude. The third stage put the satellite into orbit 27 seconds after the separation of the second stage. The satellite is running along the oval orbit 218.82 km in the nearest distance from the earth and 6,978.2 km in the farthest distance. Its period is 165 minutes 6 seconds. The satellite is equipped with necessary sounding instruments. It will contribute to promoting scientific research for peaceful use of outer space. It is also instrumental in confirming the calculation basis for the launch of practical satellites in the future. The satellite is now transmitting the melody of the immortal revolutionary hymns �Song of General Kim Il Sung' and �Song of General Kim Jong Il' and the Morse signals �Juche Korea' in 27 MHz. The rocket and satellite which our scientists and technicians correctly put into orbit at one launch are a fruition of our wisdom and technology 100 percent. The successful launch of the first artificial satellite in the DPRK greatly encourages the Korean people in the efforts to build a powerful socialist state under the wise leadership of General Secretary Kim Jong Il. This announcement was followed on September 14 by the release of a photograph of the satellite and the claim that the satellite had completed its 100th orbit of the earth between 08:24 and 11:17 local time (2017 GMT) on September 13. Video of the launch, the satellite, and an animation of the satellite in orbit around the earth were distributed to foreign news agencies the following weekend. The satellite appeared almost identical to the first Chinese test satellite (which itself appeared almost identical to the US Telstar of the 1960's). LEO Payload: 6.00 kg (13.20 lb) to a 220 km orbit at 40.00 degrees. Stage 1. 1 x Taepodong 1-1. Gross Mass: 25,649 kg (56,546 lb). Empty Mass: 3,733 kg (8,229 lb). Thrust (vac): 577.337 kN (129,791 lbf). Isp: 255 sec. Burn time: 95 sec. Isp(sl): 232 sec. Diameter: 1.80 m (5.90 ft). Span: 2.70 m (8.80 ft). Length: 12.00 m (39.00 ft). Propellants: Nitric acid/UDMH. No Engines: 4. Engine: Nodong. Status: In Production. Stage 2. 1 x Taepodong 1-2. Gross Mass: 7,505 kg (16,545 lb). Empty Mass: 1,456 kg (3,209 lb). Thrust (vac): 144.334 kN (32,448 lbf). Isp: 255 sec. Burn time: 176 sec. Isp(sl): 232 sec. Diameter: 0.96 m (3.14 ft). Span: 1.10 m (3.60 ft). Length: 12.00 m (39.00 ft). Propellants: Nitric acid/UDMH. No Engines: 1. Engine: Nodong. Status: In Production. Comments: Included 100 kg spin table for spin-up of third stage prior to release. Burn time is 33.7 seconds at full thrust, 142.3 seconds at half thrust. Stage 3. 1 x Taepodong 1-3. Gross Mass: 252 kg (555 lb). Empty Mass: 50 kg (110 lb). Thrust (vac): 18.330 kN (4,121 lbf). Isp: 250 sec. Burn time: 27 sec. Diameter: 0.30 m (0.98 ft). Span: 0.30 m (0.98 ft). Length: 1.80 m (5.90 ft). Propellants: Solid. No Engines: 1. Status: In production. Family: orbital launch vehicle, Taepodong. Country: Korea North. Engines: Nodong. Spacecraft: Kwangmyongsong. Launch Sites: Gitdaeryung. Stages: Taepodong 1-1, Taepodong 1-2, Taepodong 1-3. Bibliography: 2, 279. North Korean first space launch vehicle. 1998 August 31 - . 03:07 GMT - . Launch Site: Gitdaeryung. LV Family: Nodong 1. 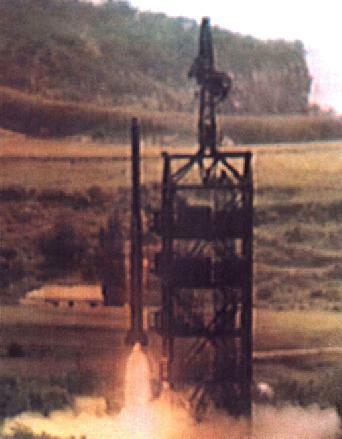 Launch Vehicle: Paektusan 1. FAILURE: Third stage failure.. Failed Stage: 3. Kwangmyongsong 1 - . Nation: Korea North. Agency: Choson. Class: Technology. Type: Navigation technology satellite. Spacecraft: Kwangmyongsong. North Korea reported the launch of its first satellite on the first of September. This announcement was followed on September 14 by the release of a photograph of the satellite and the claim that the satellite had completed its 100th orbit of the earth between 08:24 and 11:17 local time (2017 GMT) on September 13. Video of the launch, the satellite, and an animation of the satellite in orbit around the earth were distributed to foreign news agencies the following weekend. The satellite appeared almost identical to the first Chinese test satellite (which itself appeared almost identical to the US Telstar).